I figured the best way to answer most peoples questions was to write a blog post, something I haven’t done in MONTHS. It’s handy, though, for when simple facebook statuses don’t cover it. 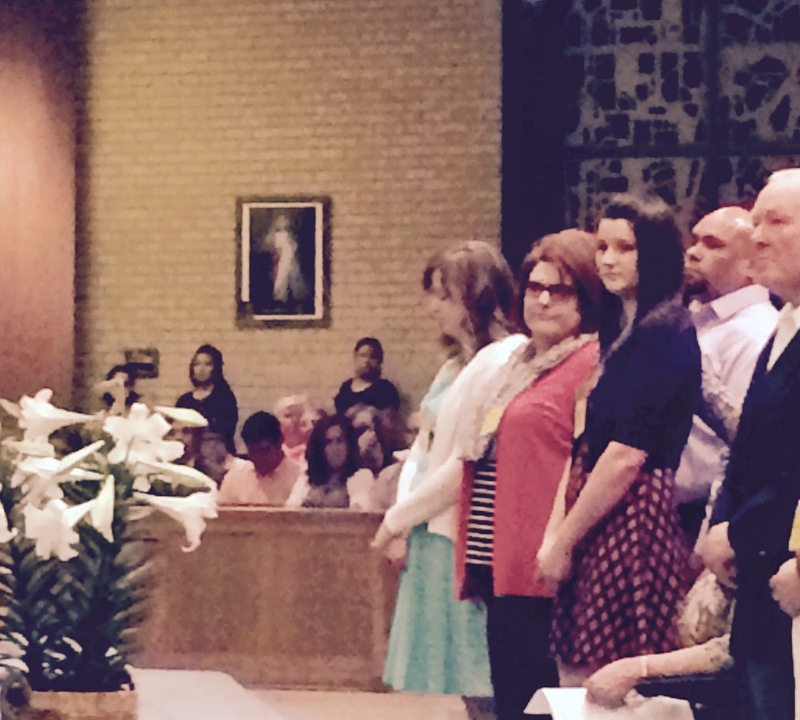 This past Sunday, along with over 900 people in the OKC Archdiocese, I was confirmed in the Roman Catholic Church. Well, like so many important things in life, this has many many answers. 1) The easiest to understand: My family. My husband was raised Catholic, we were married in the Catholic Church, my son was Baptized Catholic, and though we had discussed raising him multi-denominational in the past, in practice it just isn’t that easy. My son and husband would have a bond and connection spiritually that I would not be a part of. Being part of the Catholic church means more than just which building you enter on Sunday. There’s a unity there that only those who have joined the church get to partake in. Going to mass for 6+ years has shown me this, and until Judah I was fine with not being a part of that. But I couldn’t stand thinking there was a part of my son I would never understand. 2) The doxology. I think this is where people get hung up who know me. I was raised Southern Baptist, and joined Journey Church (Evangelical Covenant) right out of High School. Since meeting Nathan he has opened my mindset about what being a christian really means. I’ve believed for a long time that not every denomination has all the answers, and there is NOT one that is more holy or accepted by God. There is so much more to God than the labels and beliefs we assign Him. 3) The history. I don’t think anyone will deny the long history of the Catholic Church. I mean, it was the first organization of christian believers. The rich history, understanding of the Bible and how it was put together, how it is meant to go hand in hand with the Church, and how it’s words can be implemented in our lives is so wondrous to me. 4) The leaders. Yes, I mean the Pope and all the cardinals and bishops, all the way to the priests and even lay-persons. A big thinking in the Catholic church is the adjusting and flowing with the current society, with the current culture. Just research Vatican Council I & II and you’ll see a group of people that got together to change the church for the people. They adapted, while still holding to the truth and traditions of the first christians. A place that understands the value of the changing thinking and needs of the people is where I want to be. Another tenant is the understanding that the Pope is NOT the highest ranking in the Church. The people are. WE are. The Priest is the servant of the people, the Bishop the servant of the priest, the Pope the servant of us all.That sort of servant thinking, the selflessness of the church officials is a breath of fresh air to me. When I began to pray about becoming Catholic (Lent 2014), the thing holding me back was the fear that catholisim would put me in a box, would put God in a box, that I would feel held down/held back by their beliefs or practices. I was so surprised and blessed to find the complete opposite true. I have never felt more freedom, more connectedness to God, more truth about my own spirituality than now. And then, we took first communion and were welcomed into the Church. I’m so happy with my choice and I am SO looking forward to this new path God has led me down. If you have any specific questions about the Catholic Church, please comment here or message me. 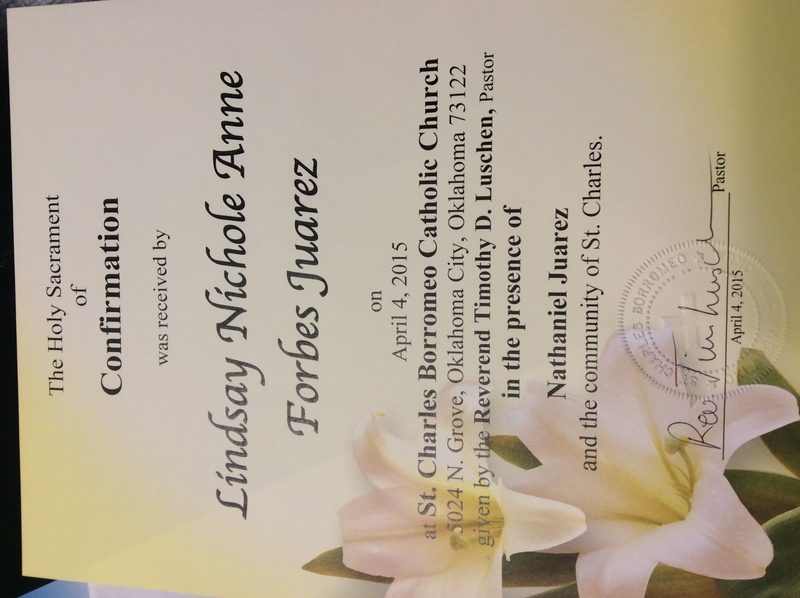 I would love to quell any anxieties about this big change in my life. This entry was posted on Tuesday, April 7th, 2015 at 9:47 pm	and posted in Uncategorized. You can follow any responses to this entry through the RSS 2.0 feed.